Perfectly Simple Pot Roast - Let the Baking Begin! This Perfectly Simple Pot Roast is the best Crock Pot Roast Recipe! Chuck Roast is slow cooked with vegetables, giving you soft and tender Pot Roast. This Slow Cooker Pot Roast is served best with gravy, mashed potatoes, rice or even pasta. The best part about this Slow Cooker Pot Roast is that the Crock Pot does all the work for you. As the Chuck Roast is tenderizing at home, you can be at work, shopping, or doing anything else. This Crock Pot Roast Recipe is simply the best! 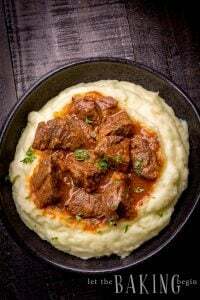 With the busy schedules that many of us have, simple but delicious recipes like this Crock Pot Roast comes in very handy. Chuck Roast on its own is a pretty flavorful cut of meat, that is if you know the proper way to cook it. Crock Pot or slow and low cooking is the only way to go when it comes to Chuck Roast. I filled my Slow Cooker with all the ingredients in it, set it for 7 hours and when I came back home I found the Chuck Roast cooked to perfection ready for whatever side dish I wanted. I went with mashed potatoes and green beans, because really, what goes better than potatoes and green beans with a Pot Roast? If you’re not the type that likes the aroma of food permeating your house, you can set the Crock Pot outside (I set it out on my balcony). Oh and the gravy! Smooth, silky and delicious beyond what I can describe! Easy too! If there’s one reason why you should own a Crock-Pot, it’s probably this Perfectly Simple Pot Roast and gravy! Enjoy! In a small bowl, combine water, salt, pepper, garlic powder, and pickling salt. Stir until salt is dissolved. If desired, sear the Chuck Roast with 1 Tbsp oil in a skillet before placing into slow cooker. Place meat into crockpot. Add carrots, onions, garlic, and water mixture. Close lid and set on “high” for 7 hours. After 7 hours, remove meat and place into a separate dish and keep warm. Set a sieve over a bowl. Pour the liquid and vegetables from crock pot through a sieve. Discard the solids and keep the liquid. In a saucepan, melt butter over medium heat, add the flour and cook for until the flour is a golden color, all while stirring to prevent burning. Slowly pour in the liquid and keep stirring with a whisk until mixture becomes thick. How do I serve the Chuck Roast? You can shred the meat with two forks into small pieces. Alternatively, you can slice the roast and serve it by slices, pouring the gravy over it. This Slow Cooker Pot Roast is served best over mashed potatoes and gravy. Also great with a side of cucumber salad or creamy green beans. Fall of the Bone Pork Ribs – The best pork ribs recipe! 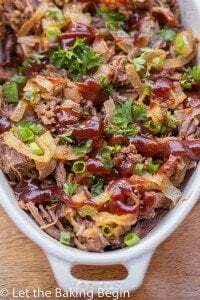 Garlic Barbecue Pot Roast – Pot roast with caramelized onions and barbecue. 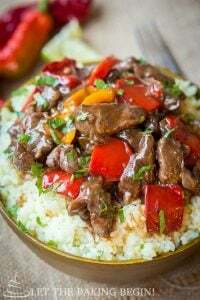 Braised Short Ribs Recipe – Short ribs cooked into juicy, tender meat chunks. This Perfectly Simple Pot Roast is the best Crock Pot Roast Recipe! 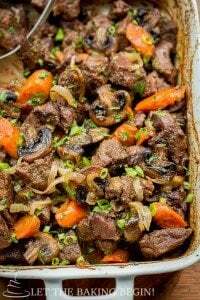 Chuck Roast slow cooked with vegetables, is super soft and tender. Combine water, salt, ground black pepper, garlic powder, and pickling spice and stir until salt is dissolved. If you desire, brown all sides of the roast on a super hot skillet with a tablespoon oil. Otherwise, place the meat into the crockpot as is, surrounded by carrots, onions, and garlic, then pour the water with the spices on top. Close with the lid and set it on “high” for 7 hours. Remove the meat to a separate dish and keep warm. Set a sieve over a bowl. Pour the remaining liquid and veggies through the sieve. Discard the solids and hold on to the liquid. In a saucepan, melt butter over medium heat, then add the flour and cook it for several minutes until it’s golden in color, all the while stirring to prevent it from burning. Slowly pour in the liquid and keep stirring with a whisk until the gravy is slightly thickened. Now shred the meat with two forks into small pieces. You can serve it over mashed potatoes, rice, another grain or pasta, and pour some gravy on top. With all seriousness, I wasn’t expecting what I got from my slow cooker today. 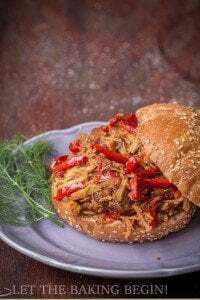 I have tried making several roasts in a slow cooker before, they were disappointing and went straight to the trash. Your roast was so good, my husband told me to make sure to keep this recipe under lock and key. I can’t wait to try your other beef dishes! Thank you so much for sharing, blessing to you and your family! I’m grinning from ear to ear 😀 I feel honored, Queen of Beef is awesome 😀 Thank you so much for your comment! I made this today for Christmas and it was stringy and chewy. Not sure what I did wrong as I followed the directions exactly. Hi Barb, sorry it didn’t go as planned… stringy and chewy sounds like it was just underdone, or it was wrong cut of meat. If the meat wasn’t the “chuck” cut then there was not enough fat within it to make it soft and fall apart tender, or if the slow cooker wasn’t set on “high” but instead was set to low, then it just needed more time to cook through. Do either of those sound like what could’ve happened? This was my first roast so I may have messed up but: My roast was 2.2 lbs so I cooked on low for the last few hours, but it still turned out a little dry. Would a shorter cook time still on high be the solution? As for the gravy, it was super sweet. Is that the pickling spice? I’ve never used it before, and while I didn’t notice it on the beef it was overpowering on the gravy. Thanks for any tips! If there was less meat, the rest of the ingredient amount should have been lessened as well. I think the overpowering sweet taste might’ve been the carrots not the pickling spice. 1 cup for a small roast might’ve been too much. I am not sure as you’re not giving me a lot of detail. As to the dryness of the roast – did you use ‘chuck’ beef? or round bottom roast? this recipe reccomends the chuck because it produces a softer more tender meat when cooked. I made this tonight and it was perfect! I usually throw all my carrots,onions and potatos in with the roast to eat with it so this was extra work (I cooked fresh green beans and mashed potatos as you did) but delicious and can honestly say I don’t think I’ll go back. Making the gravy was an extra special touch too that I normally don’t do. Loved it!! Hi Kim! Thanks for such wonderful feedback! I just started the crockpot, but realized now I only have 5.5 hours before I need to serve dinner. What should I do? In the future you can cook it in a regular pot on the stove and it will take around 3-4 hours, or roast it in the oven for about the same amount of time (3-4 hours) at 325F. I don’t own a crock pot. Is it possible to bake this pot roast in the oven? What temperature and for how long? Yes, just use a dutch oven or a baking dish, just put everything in. I would roast it at 350F, covered, for about 3 to 3.5 hours. I appreciate that Marina. I’m a new blogger and need those advises. Thanks so much! Let’s give it a try…. Thank you for this awesome recipe!!!! One question what brand of crock pot do u recommend/use? I don’t own one but would really love to! Ok thank for your tip this helps me narrow it down a little! !